Scientists from the Weizmann Institute of Science in Israel and San Diego State University have observed an explosion of a star 50 times larger than the sun. In what they call a “first observation of its kind” the scientists were able to notice that most of the star’s mass collapsed in on itself, resulting in a creation of a large black hole. While exploding stars, or “supernovae,” have been previously detected using advanced research satellites, this recent explosion is the largest exploding star observed so far. The phenomenon strengthens a theory that according to which stars ranging from tens to hundreds of times the mass of our sun all end their lifetime as black holes. 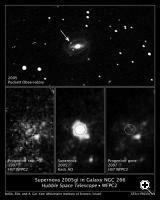 exploded as a supernova in 2005. The star, which lay about 200 million light years away from earth and was million times brighter than the Sun, has exploded as a supernova at a much earlier date than the one predicted by astronomers. The phenomenon was captured by Dr. Avishay Gal-Yam of the Weizmann Institute’s Faculty of Physics in Israel and Professor Douglas Leonard of San Diego State University. According to the scientists, any star’s “death” is predetermined by factors such as its size and “power plant,” which keeps it shining during its lifetime. “Stars, among them our sun, are fueled by hydrogen nuclei fusing together into helium in the intense heat and pressure of their inner cores. A helium nucleus is a bit lighter than the sum of the masses of the four hydrogen nuclei that went into making it and, from Einstein’s theory of relativity (E=MC^2), we know that the missing mass is released as energy” – explain Gal-Yam and Leonard. While relatively small stars, like our own sun, burn out in a ”small puff of expansion,” larger stars behave differently – as nuclear fusion continues after the hydrogen is exhausted, heavier elements are being produced in the star’s different layers. At one point, the core of the star turns to iron, causing enormous heat and pressure to build up in its center. This, in turn, causes the iron nuclei to break apart into their component protons and neutrons. “At some point the core and the layer above it collapse inward, firing the rest of the star’s material rapidly out into space in a supernova flash” – explain the scientists. A supernova, whose flash is so bright it can be seen from Earth in daytime even if occurring hundreds of light years away, is accompanied by the star’s collapse inward. The gravity of this collapse causes the protons and electrons to squeeze together to form neutrons. Astronomers say that it is possible that during this event, the star’s core will be reduced from a sphere 10,000 km in circumference to one 100 times smaller. “Just a crate-full of this star’s material weighs as much as our entire Earth” – say the scientists. “But when the exploding star is 20 times the mass of our sun or more, its gravitational pull becomes so powerful that even light waves are held in place. Such a star – a black hole – is invisible for all intents and purposes,” they add. Using the Keck Telescope on Mauna Kea in Hawaii, the scientists have identified a star potentially close to explosion, whose mass was estimated to be equal to 50-100 Suns. Their observations revealed that while a small part of the star’s mass was “flung off” in the explosion, most of the material, according to Gal-Yam, was “drawn into the collapsing core as its gravitational pull mounted.” In subsequent images taken of that region of the sky, the star does seem to have disappeared, which led the astronomers to conclude that it has, indeed, become a black hole. The explosion of such an ‘immature’ star has led scientists to put existing theories of stellar evolution to doubt – “This might mean that we are fundamentally wrong about the evolution of massive stars, and that theories need revising,” said Gal-Yam. He also noted that the unusual brightness of the progenitor indicated that the star belonged to a family of “Luminous Blue Variables” (LBVs) – these are characterized by shedding much of their mass through a violent stellar wind, what eventually triggers their explosion as supernovae. “The progenitor identification shows that, at least in some cases, massive stars explode before losing most of their hydrogen envelope, suggesting that the evolution of the core and the evolution of the envelope are less coupled than previously thought, a finding which may require a revision of stellar evolution theory,” said Leonard. It has been suggested that the progenitor was, in fact that of a merged pair of stars, hence the unusual brightness. Even if that is indeed the case, the scientists say the observation has left them questioning whether there are more yet unknown mechanisms that trigger supernova explosions. “We may be missing something very basic in understanding how a superluminous star goes through mass loss” – said Gal-Yam. TFOT has previously covered a number of innovative findings in the field of astronomy including a novel theory on galaxy formation, proposed by astrophysicists of the Hebrew University and a research that succeeded to resolve issues surrounding dark matter structures in the Milky Way, shedding some light on the enigmatic dark matter. More information about supernova can be found here.